I started my day today on a solo excursion up the street from our hotel. I stopped at Cafe Pierre on Boulevard Magenta to have my morning (or actually early afternoon) cappuccino. The sky is overcast today and the it is windy and a bit chilly, but when the sun comes out it warms quickly. I spent time at several street corners with my camera in hand snapping cyclists – I was amazed at how well they navigate the traffic and the streets – people of all ages, sizes, men, women and kids! 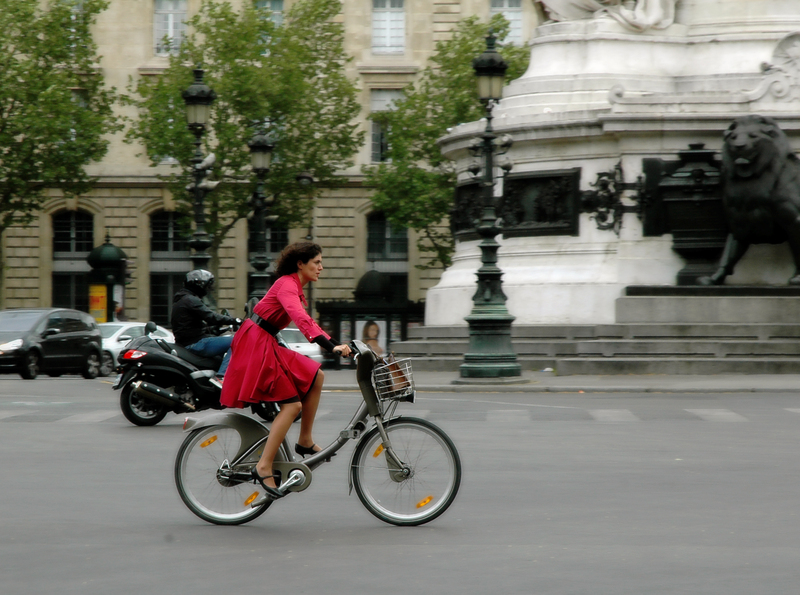 I snapped the photo below of a beautiful Parisian dressed to kill and on her bike! You would NEVER see this in Dallas!!! The city is bustling all around me and inspires my muse…. and before your final goodbye. Wow she even has heels on and I love the color of her coat!! Amazing pic and I love the verse too! Thanks Deb! I couldn’t believe it when I saw her riding the bike and it was in rush-hour traffic. So Parisian!